Yes, there’s more to say about Germany’s new third gender law, especially to readers that understand the LGBTI perspective and the issues that affect us. Also, I got to correct inaccurate press statements about Australia’s third gender law applying to intersex babies, which it doesn’t, just adults who want it. 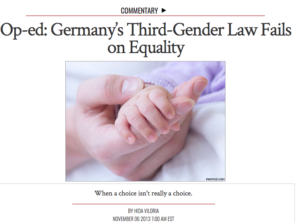 Read “Germany’s Third Gender Law Fails on Equality” here.